Let's see first what is Skype. Skype is a very easy to use computer technology that facilitates a face to face, real time conversation between two or more persons. But it's not only that it can be used for chat, messaging and or sharing digital data like pictures and any type of digital files. It can also be used in any type of device including desktop computers, smartphones, and tablets. Skype can be quickly downloaded to your computer device from the web site www.skype.com. It's available for all known operating systems. The computer requirements for Skype are minimal; any computer and/or device capable of using the Internet can use Skype. But the basic system requirements include a webcam and a microphone. These are available at any computer or accessories store like Radio Shack, eBay, Office Max, Office Depot, Best Buy, etc for under $10 and are very easy to install on any plug and play computer device! If you own a newer computer and or device you don't have to buy these since your device comes equipped with a built in camera, and microphone. In case you need more information or support for Skype you could visit the Skype Support website. Skype can be used for free on a Skype to Skype visual/video conversation. It's just like email as long as it is a Skype to Skype conversation. The same applies for Skype Chat and transfering of anytype of digital files. Information and general directions for using Skype can be found at www.skype.com. However, there are a few pointers that you will not find there conserning a session for web therapy. Before using Skype for a counseling session you can practice with a friend or relative who also has Skype. During this test call you can get the microphone and camera set for best experience. If you buy a webcam, after its installtion it may have its own program and icon or shortcut on your computer screen. Microsoft LifeCam does that. Since Skype needs exclusive access to your webcam when it runs you cannot run any other program that uses your webcam simultaneously with Skype. I will call you using your Skype ID at the designated time. We will then have a web therapy face to face consultation. Are you ready for an online therapy session at web therapy via Skype? 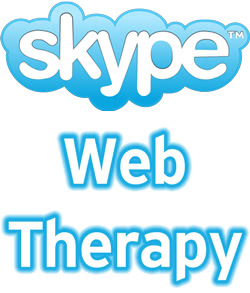 For any questions concerning web therapy skype sessions please write to me at support[@]mywebtherapy.org.